I wrote a column recently about being given a packet of letters written by two boys fighting in the Civil War back to their family here in Indiana. Remembering those letters made me recall how impressed I was with the education those boys seemed to have received despite having attended small rural schools in Indiana. And that made me think of a book I bought once at an auction for $1. I went looking for it and found it. 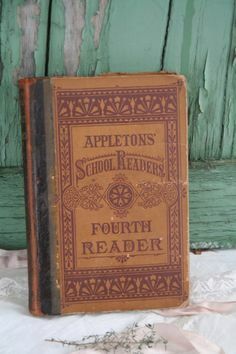 This book, an Indiana State Series, Fourth Grade Reader, was owned by a little girl named Minnie Gaskill who went to elementary school in Markle sometime around the turn of the century...the last century. It is approximately 125 years since the Indiana School Book Company published Minnie’s little book and we, as a country, are currently engaged in great controversy and debate about our how school system should be administered. No Child Left Behind....Charter schools....funding....for-profit schools...extreme testing. Here in Indiana, the governor and the Republican-dominated legislature are at odds with most educators and many parents. In light of all this, it is curious to look back to see what was expected of a typical fourth grader in the late 1800’s. I don’t remember what my books were like then but I know Minnie’s lessons strike me as a lot farther advanced than what I was taught at that age. Her first reading lesson consisted of a four-page, illustrated story on the life of Benjamin Franklin. Afterwards, her teacher questioned students on the leading facts of the piece. For their “written expression” they were expected to compose from memory a selected portion of the story. Minnie’s reader was stuffed with history, health, science and geography. Before the year was over, she learned about Andrew Jackson, George Washington, the Romans, the Battle of Bunker Hill, Nathaniel Hawthorne, the most useful metals, the Sahara Desert and much more. The book was not backward about using readings as a springboard for debating moral conclusions. In illustrating right from wrong, it drew from poems, stories, the Bible, “Poor Richard’s Sayings” and “Aesop’s Fables”. At the end of each lesson, the students were expected to learn word definitions. Many of them would be difficult for adults in 2013. Here are a selection at the end of one story: patriarchal, adjoining, primeval, solitary, armorial, sonorous, wan, wane, zenith. From the same lesson, the spelling list included: reigns, balmy, twofold, icicles, heirloom, anise-seed, initials and zenith. After reading a story about Daniel Webster, Markle’s fourth graders were given instructions to: write from memory a short sketch of Webster, dividing their subject into 1) his date and state of birth and residence as a man, 2) his characteristics as a boy, 3) his chief distinctions as a man and 4) any anecdote you have heard of him. I have not had a child in the public school system for decades but studying the reader leads to the conclusion that over the last century, we have required less of each succeeding generation of American students. Am I wrong?